The case studies below have been used in innovative teaching practice with the aim of actively engaging students in more formative, dialogue-based feedback. The introduction of audio feedback into a third year advanced option enhanced opportunities for dialogue in subsequent one-to-one sessions between tutor and student. The provision of audio feedback did not take any more time than providing written feedback on essays but there was over a three-fold increase in the amount of feedback given. 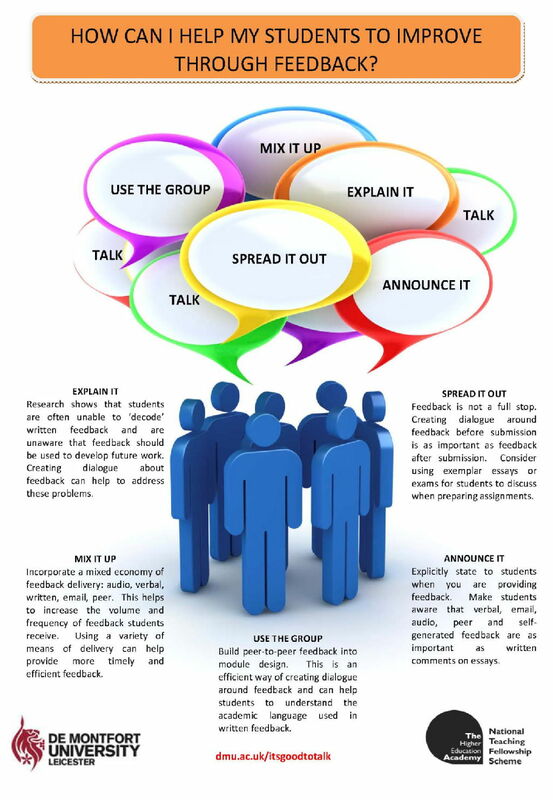 The style of feedback was also considered by students to be more direct, explicit and accessible than written feedback. View a short movie presentation showing how Adobe Acrobat Pro can be used to enhance feedback on essays, including the recording of brief audio comments. Surprisingly, feedback is rarely provided on formal written examinations in HE History. This is partly because traditionally this was not the practice and also because of the pressure of time during the examination period. Yet, setting assessments which have no feedback mechanisms is not good practice and students are left with no guidance about their performance or how to improve. This case study considers a department-wide initiative to introduce feedback on written examinations. The strategy used was to produce a simple template for a cover sheet. This could be used by both students and examiners. Student feedback was brief and focused on ‘ways to improve’. The system has been in place for three years and is commended by external examiners and by the students themselves. In order to provide quick and easily accessible written feedback to students on their short essays in preparation for face-to-face meetings,this case study utilises Sitebuilder’s Data Reveal page format. This template allows for the quick upload of a CSV or Excel document, which contains student data, and for students to access, via a password-protected webpage, secure and personalised feedback information on their previous essays. The aim is to provide students with concrete feedback alongside possible face-to-face discussions so that they can re-examine their writing and formulate questions and comments to bring to meetings with tutors. Exam feedback can be considered to fall into two areas; individual feedback on a student’s own performance in an exam; and generic feedback on previous years’ students’ performance to help improve the performance and satisfaction of following years’ cohorts. Individual opportunities to receive feedback on exam performance could be available to all students. In practice, third year students, who have passed their exams, are very unlikely to take advantage of the opportunity. However, first and second year students could be provided with feedback on the strengths and areas for improvement on their performance. 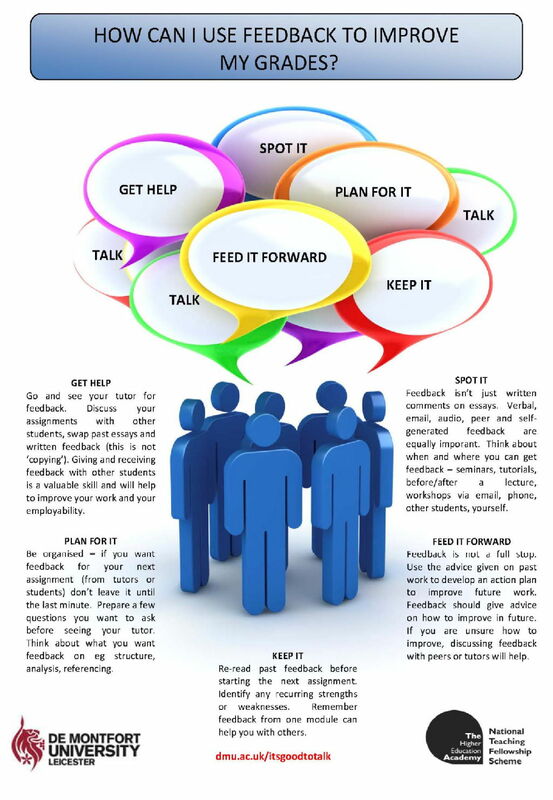 Of wider application is the opportunity to provide generic feedback to subsequent years’ students. This could be built into the exam setting and marking process and into course handbooks and teaching schedules. This project primarily focused on piloting an approach to achieving this, using De Montfort’s 2011 HIST 2002 exams as the test-bed. Feedback is clearly one of the fundamental aspects of the teaching and learning process in the subject of Creative Writing: students learn how to ‘improve’ their writing in various different contexts through readers giving honest critical feedback about their work. Peer feedback specifically has always played a large part in the subject, and Creative Writing ‘workshops’ often consist of students critiquing one another’s work. As Heather Leach writes: ‘The major value of a writer’s workshop is to have your work read and discussed by the other members of the group and to read and discuss the work of others in their turn.’ This research project investigates a form of informal (unassessed) peer feedback in a third-year undergraduate module in Creative Writing at De Montfort University. The project aimed to question the extent that meaningful dialogue can take place within this transmission–based model. We aimed to develop an alternative feedback model in which dialogue would precede and inform the grading of students’ work. In doing so, we engaged with literature relating to democratic education and aimed to identify characteristics of feedback that are not only more collaborative and dialogic, but also more democratic. This exercise used exemplar assignments as a means of creating dialogue around assessment criteria and feedback. The exercise was conducted in advance of students submitting an assessed coursework essay. The trial stemmed from a desire to engage students with feedback so that they could understand what is required of them when writing essays; prompted by previous cohort's poor essay marks and a lack of application and understanding of the academic requirements.